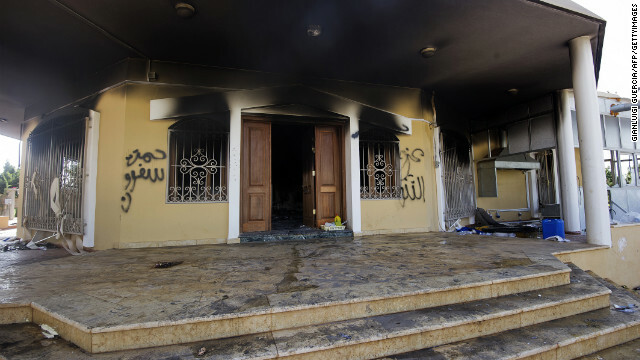 Al-Shibli - whose name also has been spelled "Chalabi" - is the only known suspect in custody in connection with the Benghazi attack. A 26-year-old Tunisian, Ali Ani al Harzi, was held in Tunis for several weeks in connection with the assault on the compound after being extradited from Turkey but was released by a judge in January because of insufficient evidence. The U.S. official said it was "advantageous" that al-Shibli was in Libyan custody, but there is not enough evidence to make an arrest at this point. Rogers told State of the Union that arresting al-Shibli could make it harder to question him. "The problem with criminalizing this is that it lengthens the process. It slows everything down, and the key to these things is getting information soon," he said. But the Intelligence Committee's ranking Democrat, Maryland Rep. C.A. "Dutch" Ruppersberger, said other jihadists charged with crimes in U.S. courts had continued cooperating even after being read their rights. "We, as a nation, are the strongest country in the world," he told CNN. "And we need to show that we can try people and convict people in our country and protect witnesses and everything else. So, there are a lot of issues here, but it's got to depend on a case-by-case basis." Q: A Pakistani, a Yemeni, and a Somalian were taking a ride in a car in New York. Who was driving? @chrissy and banasy - But, but, but... Osama was not killed in Pakistan.... Americans are spreading rumors that he was killed in Pakistan. @saywhat - You nailed it. I completely agree with "saywhat". Pakistan gives 100% safety guarantee to terrorists. Americans are ruining Pakistan's reputation. I also agree with myself - I am so smart. And I am an Islamist too. Thank you, thank you, thank you, Pakistan. Pakistan trained Al-Shibli. May Allah bless Al-Shibli and Malala and Osama bin Laden. Good bless Pakistan. Go Pakistan. Pakistan will rise and train more terrorists. God speed. @saywhat – You hit the nail on the head. Only Pakistan could have trained Al-Shibli so well. Al-Shibli did not complete his training and was caught. But that was his fault. So, Pakistan will not refund his terrorist training fee. @saywhat – Those right wing thugs in Washington have nothing better to do than catching this Pakistan trained terrorist. But think I go to the same mosque where this terrorist Al-Shibli was trained. g'night. @chrissy – well said. Pakistanis are especially proud when terrorists attend their mosque and receive training. Hi banasy - I think this guy went to my mosque in Pakistan. I am an Islamist. This is terrorism, not a bank robbery. Interrogate first using whatever means necessary. Ultimately many civilian lives will be saved. "al-Shibli had recently returned to Libya from Pakistan"
Cut off the head of the snake, Pakistan.